I was recommended this book by a very unlikely source: my peers in school. A number of them were almost ecstatic about this book, and this put me instantly on my guard. I prepared myself for a light-hearted chick-lit, to be forgotten as soon as it is read. But when I finally laid my hands upon the book and read the back page summary, I was instantly hooked. The Mahabharata, my father always says, is one book that no Indian should die without reading. I have read the children’s version of the epic, so I know the outline of the story. I do appreciate the unbiased compilation of events listed in the original book, but reading the epic from the point of view of a character as powerful as Draupadi is a vastly enriching experience by itself. The first thing that struck me even before I began with the book was its title. 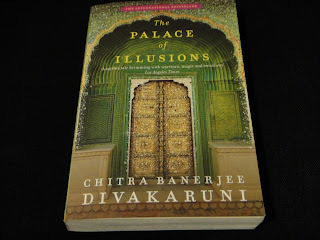 “The Palace of Illusions” sounded like a mystical title shrouded in fantasy. I wondered about the aptness of the name, given that it is a story of bloodshed and gore and the lust for fame and power. But with the progress of the book, I started realizing little by little why the name was very appropriate after all: the book increasingly filled me with wonder and made me question some of my basic thoughts and ideas about life and death. Are our lives really anything more than dreams, and the deaths that plague human life merely the passing of souls beyond the territory of the dream that is life? Just like Draupadi’s prized palace of Indraprastha, her greatest treasure and possession that begot such jealousy in the hearts of thousands, our lives are illusory and transient too. The things we hold on to most desperately in life are all temporary, and are washed away by the sands of time. In fact, non-scientific person though I am, I am reminded of the concept of atoms and molecules. Aren’t they mostly empty space surrounding a minuscule drop of tangible matter in their centres? Then, being made up of these same molecules, are we anything more than space ourselves? In this book, Chitra Banerjee Divakaruni gives us her version of The Mahabharata through the eyes of the fiery daughter of the king of Panchal. A woman in a man’s world, she is forever a misfit. She aspires to achieve greatness, and bring the prophecy that had accompanied her birth, about her changing the course of history, true through her own conscious actions. Never really wanted right from birth, she is feared, envied and shunned by women, and desired yet rebuked by men all her life. Her life follows a path of bitterness, glory, pride, loss and remorse, until she finally attains self-realization on her way along the maha-prasthan, the last earthly route to heaven. The most powerful woman of the age dies a lone figure on the icy crevices of the mountains, left behind by her five husbands, and finally comes to term with the purpose of her life and death. Reading the book, my ideas about right and wrong were greatly shaken. I was forcefully reminded of a profound truth about life: it is very difficult to distinguish between the good and the bad. Life is not black and white; there are no clear cut heroes and villains in life. Thinking back, I cannot recall even one completely good character. Think about the atrocities wrought, the humiliations brought about by Drona, Drupad, Dhritarashtra, Kunti, you name it, to satisfy their own interests or through silent sanction. Also, quite often it is one’s weaknesses that make one great: Yudhisthir followed moral principles and tried to uplift his wife spiritually, yet it was Bheem who truly loved her. Talking about Yudhisthir, I have always held a personal distaste for him. I think it has something to do with his unrelenting adherence to what he understood as dharma. To him, what mattered were only his principles, and not the emotions that his actions inspired in others. Even if others were hurt, he would go ahead with his strict moral code. In her analysis of her husbands’ characters, Panchali has repeatedly expressed her helpless rage at the false sense of honour that all them carried. I agree with her wholeheartedly when her heart raises questions about the necessity or glory of keeping one’s word, even at the cost of another’s life or honour. What moral code was it that allowed Yudhisthir to go ahead with the game of dice where he lost everything, even his brothers and his wife? And what honour was it that stopped any of the brothers and all the other courtiers from coming to Draupadi’s aid when she was being humiliated by Dushshasan in full view of all present? Are codes and rules and procedures really so much more important than human feelings? Are codes of conduct made for the benefit of human beings, or is it really the other way round? The book is a superb study of human relationships. Panchali’s feelings towards her five husbands are as diverse as the people themselves. She is especially attracted to Arjun, the man who really won her at her swayamvar, and she almost challenges herself to win his special love and care. For Yudhisthir she holds a reserved and respectful, and maybe a little distant, love. Bheem, who she senses has fallen completely in love with her, she heartlessly utilizes and even exploits. Bheem, always so eager to please, so fast with his anger as well as his forgiveness, is almost a plaything to her. While reading the book, I had this sudden thought, that I would consider myself lucky to get a husband like him. Nakul and Sahadev are more like brothers to her, though she does share their beds. And then there is Karna. The man with the ancient eyes: ignored and humiliated all his life. Abandoned by his own mother at birth, he is brought up by a boatman. His father’s identity is unknown to him, and this causes him terrible shame and suffering throughout his life. Even Draupadi, the woman he adores in his heart, rejects him at her swayamvar. Finally, at the eve of the great war, he is approached by Kunti, who at last acknowledges him to be her eldest son. This causes him more pain, as he dies with the knowledge that he had fought his own siblings. Throughout the entire book, he is the only character for whom my heart really reaches out. His pain is incomparable, except perhaps with Bhishma, the Grandfather. Before I wrap up my essay, I want to add a few lines about the blue God. Krishna, our very own household deity. He was truly alive in flesh and blood. He led the war, but not without deceit. He remained aloof and detached to a large extent when he could have prevented the war. He could not justify the necessity of the war, the pain, the death, so that even the victors wondered, long after everything was over, about whether they had made the right choices. Divine thought he was, he died a rather pathetic death and his entire clan was wiped out, all by the curse of a mere mortal woman. And yet, in spite of all these uninspiring details about his life on earth, he is the beginning and the end. He is the universe himself. And it is to him that we will all go back when our time comes, just as Panchali did. I'm new to reading your blogroll. Mother and grandfather have had told me about the Ramayana and the Mahabharata a thousand times now. I have not yet been able to read any of our epics in detail but have had to draw my conclusions on both, based on the summaries that I vaguely remember. And I have always liked the Ramayana better. Today, reading you post, the Mahabharata endeared to my heart a bit more. Welcome to the blog! I am glad you commented, and I hope my review has enthused you adequately to read at least the children's version of both the epics. Philosophical ideas apart, these epics are wonderful stories by themselves. So do make time and read them when you can, preferably in Bengali. This is nothing short of a fantastic review. I thought I’d save it when I found it on Tuesday but read it more than three times. I haven’t been able to find the book as yet though. I have read a few translations of The Mahabharata but they were none from the perspective of a single character. Draupadi is certainly one female character who stands out in epics and myths, and you’ve expressed perfectly of how she was seen by the men and women around her. Does this book hint at how and why she herself agreed to marry all the Pandava brothers when it was Arjuna who won her at her Swayamvara? I remember your dad brought this up on his review of the grand translation of The Mahabharata. All I remember is Krishna telling her once that all the characteristics that she’d wanted in her husband were not to be found in one man – and therefore she got what she wanted but not the way she would have imagined – and she didn’t argue. From the Doordarshan presentation I remember Kunti telling her sons to divide the ‘bhikhsha’ for the day among themselves right after the brothers had joked that they had brought home their ‘bhiksha’. The mother’s word could not be discarded at all apparently and so Draupadi was shared among all the brothers…I do think that if Draupadi had not wanted to be a wife to all of them and share their beds – she would have said ‘no’. Nobody could have forced a woman like her – and when she loved Arjuna the most. I can see how Kunti had her own interest in keeping her sons together – and she with her instincts knew that Draupadi would need to be a wife to all the brothers if the brothers were not to get jealous. I have never really understood why Yudhisthir gambled his wife away in the game of dice. I don’t even see how he preserved his honour by gambling his wife. He reminds me of Ram. Of course I get confused when I think that Ram and Krishna are both supposed to be the earthly representations of Vishnu. And even if it was a sense of duty/dharma that guided Yudhisthir – I don’t know how he explains to Draupadi why he didn’t protect her honour in court. Krishna comes to the rescue – yes…and this is where matters get mysterious. Krishna does have (a) strange role/s in The Mahabharata. It’s as though some of his specific identities come up here – and only some of his avatars. As for his ignominious death – I think maybe he chose it and maybe it didn’t matter to him. I’m curious as to how Panchali sees Krishna in this book. None of the characters come across as being wholly good in the few translations that even I remember. I have been and am rather fond of Bhishma and Karna and Arjun and Krishna - but then after reading your dad’s review from a couple of years ago – I don’t know what to make of Bhishma’s long sermon to Yudhisthir. It sounds utterly batty in parts. I think some of the characters are better in how they act and why they act the way they do. As for your weaved-in threads about life being a dream with the awakening after the dream of life - I have very often felt the same way and I remember that your dad has that line from the nursery rhyme ‘row, row row your boat…life is but a dream’ in his book for you. As for your musings about us being atoms and molecules and ‘space’ – what I think matters is what hovers in that space…and who and what we hold dear – not material items or things – but individuals and relationships and feelings and thoughts and conscience and our actions of ‘the rowing of the boat’. I think what matters is how well we play the game and whether and what and whom and how we love. This is a grand review of the book Pupu – and I could go on for a little longer but I’ll end this comment for now. Thanks for writing this nice review and it urges me to pick up this book to read. A suggestion: Do read Mrityunjaya: The Death Conqueror by Shivaji Sawant. It retells Mahabharata from the point of view of Karna and also paints an enigmatic picture of Krishna. I had put up a review of the book long time ago in my blog. Dear Pupu, I am writing a long time after I have actually read this book on your recommendation. Thank you so much for recommending it. I loved the experience of reading it so much so that I deferred my finishing it! Thanks again. Keep reading!